Enjoy a relaxing cruise on the American Queen, the largest steamboat ever built! The American Queen Steamboat Company offers a premium cruising experience, transporting its passengers back in time to a more leisurely age. The chic, Victorian-style American Queen boasts an opulent interior of polished Tiffany glass and rich mahogany, and the best hospitality the south has to offer. With six decks, stunning staterooms, a fitness center, and a library aptly named for Mark Twain, a trip on the American Queen, the largest riverboat ever built, is a dream come true. Traveling down the Mississippi and its tributaries, the American Queen offers shore excursions at all ports, and delicious, regionally-inspired gastronomy en route. The comfort on board perfectly matches the stunning scenery outside: discover Mark Twain’s country, visit Civil War memorial sites, and witness the crisp simplicity of historic plantation homes. Centuries-old oak trees and sweet-smelling magnolias stand proudly by the side of the river, and passengers are invited to discover an authentic side of the south without compromising on comfort or style. 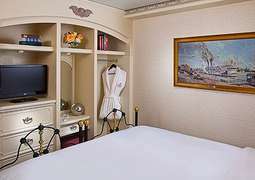 Tastefully decorated with polished wood and Victorian prints, the staterooms on the American Queen are spacious and comfortable. Select from inside staterooms (132-140 sq. 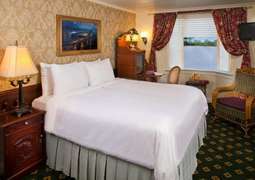 ft) or outside staterooms (140-230 sq. ft). There are even accommodation options for solo travelers with (140 sq. ft) or without (80 sq. ft) an open veranda. Deluxe outside cabins (90 sq. ft) boast either their own large bay windows or an open veranda, while the Superior outside staterooms (210 sq. ft) offer a little more space as well as access to the deck. Luxury suites (353-363 sq. ft), and Owners suites (348 sq. ft) are beautifully finished, and come with the services of a river butler. A host of American chefs offer excellent dining options, inspired by various heartland regions of the U.S. Enjoy your meals in the dining room, or treat yourself to room service, which is available 24 hours a day. Stay active in the fitness center or treat yourself to a luxury spa treatment. It’s all here on board the American Queen. When the sun goes down, the stars come out to play. Enjoy top entertainment every night of your cruise in the stunning Grand Saloon, a beautifully finished entertainment venue reminiscent of a 19th century opera house. Watch cabaret acts and dance the night away to the sweet sounds of regional music in the Engine Room Bar, where you’ll find music spanning all genres, including jazz, blues, ragtime, rock 'n' roll, country, and bluegrass. There is no real dress code onboard the American Queen, but most guests opt for country club casual.